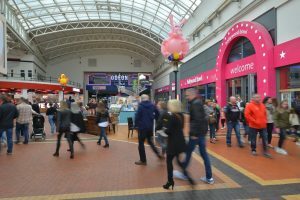 From pop stars to popcorn – to the world’s most expensive milkshake – as it gears up to welcome a whole host of events to celebrate it twentieth anniversary this month (August), it’s safe to say the Red Dragon Centre in Cardiff Bay has had quite an eventful two decades! August 1997 – Will Smith and Puff Daddy both hit number one in the charts – Men in Black and I’ll Be Missing You were surely songs of the era; and anyone who was anyone was addicted to Friends. 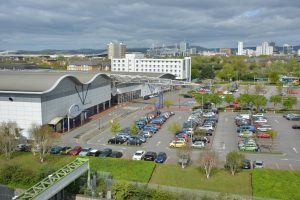 It was also the month that Louise (then still Nurding) of Eternal fame opened The Atlantic Wharf Leisure Village – as it was originally known – in the centre of Cardiff Bay, in front of hundreds of excited fans. Promising to be the ultimate entertainment destination for South Wales, the now Red Dragon Centre boasted a state-of-the-art 26 lane bowling alley with Hollywood Bowl and a twelve screen cinema in the form of the ODEON Both former venues are still at the Centre today with ODEON seeing 15 million film goers through its doors in the last twenty years. The cinema also now features the only IMAX in South Wales. Another outlet that has been part of the Red Dragon Centre’s journey from the beginning is Italian favourite Bella Italia. Previously known as Mamma Amalfi, Bella Italia has over the last two decades served 200,000 pizzas, 450,000 pasta dishes, and 2.5 million meals. If you stretched out all the spaghetti dishes served, it would total 500 miles. Capital FM South Wales has been broadcasting its popular radio programmes from its studio within the Centre since the turn of the millennium and has so far clocked up an impressive 148,000 hours of broadcasting. Guests to have graced the Cardiff Bay studio include Westlife, Keith Lemon, James Cordon, Ruth Jones, Little Mix, McFly – and not forgetting, Keith Chegwin! In 2004, the Centre added to its entertainment offering with the opening of the Grosvenor Casino – a popular post-cinema haunt for those looking to place their bets on a good night. High profile fast food favourite Five Guys became the latest food favourite to base itself at the Centre joining the likes of Grill & Shake, Bella Italia, Spice Route, Oriental Garden, Chicken House and Cadwaladers. Famously, Grill & Shake created the world’s most expensive vanilla milkshake to celebrate last year’s National Vanilla Milkshake Day. The exclusive £50 ‘Millionaire’s Milkshake’ included some of the most expensive ingredients from around the world including Tahitian vanilla pods, rich Jersey milk, strands of saffron, 23ct edible gold leaf, shavings of Italian black truffle from Umbria and Amedei chocolate from the Tuscany region of Italy. “So much has changed since the Red Dragon Centre opened back in 1997 – but then so much has stayed the same too; in that we still do what was always set out to be done and provide a top class entertainment destination in the heart of what is now a truly bustling Bay area. Louise Nurding (Redknapp) officially opened the Centre on a stage in the car park. The Centre is home to the only IMAX in South Wales. Grill & Shake in the Centre created the world’s most expensive vanilla milkshake to celebrate National Vanilla Milkshake Day on Saturday 20th June. The exclusive £50 ‘Millionaire’s Milkshake’ included some of the most expensive ingredients from around the world including Tahitian vanilla pods, rich Jersey milk, strands of saffron, 23ct edible gold leaf, shavings of Italian black truffle from Umbria and Amedei chocolate from the Tuscany region of Italy. In 20 years, Bella Italia has served 200,000 pizzas, 450,000 pasta dishes, and 2.5 million meals. If you stretched out all the spaghetti dishes served, it would be 500 miles! Before the Centre was built, the site used to be dockland. Odeon was the very first tenant to sign up to the Centre. There are over 250,000 possible ways to order a burger at Five Guys – and over 1,000 ways to customise your Five Guys milkshake. The highest score you can get at Hollywood Bowl is 300 – which is achieved by bowling 12 strikes in a row in a single game. Scenes from the 1999 cult film, Human Traffic, was filmed in the Centre – look up ‘Nina’s quitting’! The Grosvenor Casino is open 24 hours a day. Did you know the Earl of Sandwich invented the sandwich because he didn’t want to leave the casino to eat his meal! The Odeon has welcomed 15 million cinema goers over the past 20 years. Spice Route offers a unique blend of authentic Halal Pan/Asian Indian style cuisine to suit everyone’s taste, but did you know the hottest chilli according to the Guinness World Records is the Carolina Reaper which measures 2,200,000 Scoville heat units! Cadwalader’s amazing ice cream is based on a traditional recipe by Hannah Cadwalader from 1920! Capital FM has welcomed guests including Westlife, Keith Lemon, Davina McCall, James Cordon, Ruth Jones, Labyrinth, Little Mix, McFly, Will Young, Sophie Ellis Bextor, Keith Chegwin, Olly Murrs, Union J, Rixton, Lawson, Katherine Jenkins, the cast of the Valleys, Peter Andre, Stereophonics, Manic Street Preachers, Ocean Colour Scene, Five after Midnight, Tiny Temper, Louisa Johnson, Joe Wicks, Gok Wan…..the list goes on and on! In total, the Centre has welcomed approximately 45million people in the past twenty years!